Nothing beats a lazy Saturday (or Wednesday evening) at the Boulder Farmers Market. You can find anything to satisfy your taste buds, pick up some fresh fruit and veggies, and even snap that perfect instagram photo. 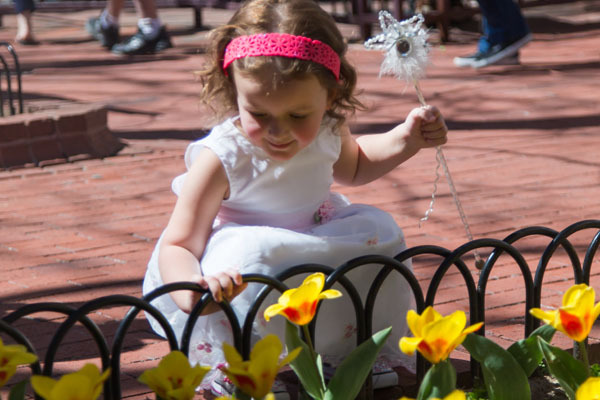 If you’re looking forward to spring as much as I am, you’ll love the Tulip Fairy and Elf Festival. This long time tradition celebrates the more than 15,000 tulips that bloom on the mall every year. This event is perfect for the littles ones who will enjoy live stage performances, face painting, free activities and more! All of you foodies out there will love this one. Get an inside taste some of Boulder's best chefs. Enjoy a leisurely stroll in and out of Downtown's best shops and galleries while indulging in food from a few of the best chefs in Colorado and tasting Colorado's finest wines (and distilleries). Tickets are limited so buy them soon if you’re interested! Nothing makes a city more unique than their art and Boulder is one of the most artistic place I’ve ever been. Thankfully, you can experience it up close during Boulder Arts Week. You can celebrate the city’s excellent artists and arts & culture offerings including art walks, First Fridays, exhibitions, performances, dance, music, theater, public art, artist demonstrations, lectures, readings, and workshops. Want to do the most Boulder thing you can think of? Rent a bike from Boulder B-Cycle. Rentals start at $8 for 24 hours! Spring is just around the corner, and we'll see you then!